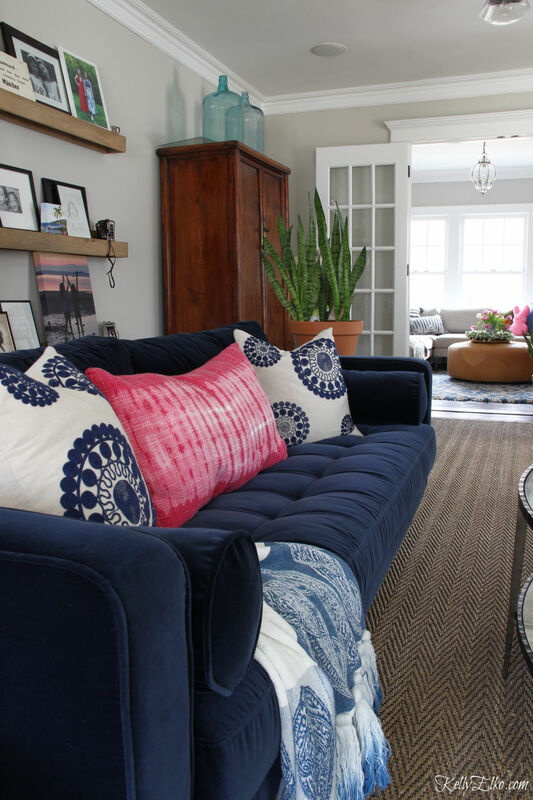 A change of seasons is the perfect excuse to refresh your home. 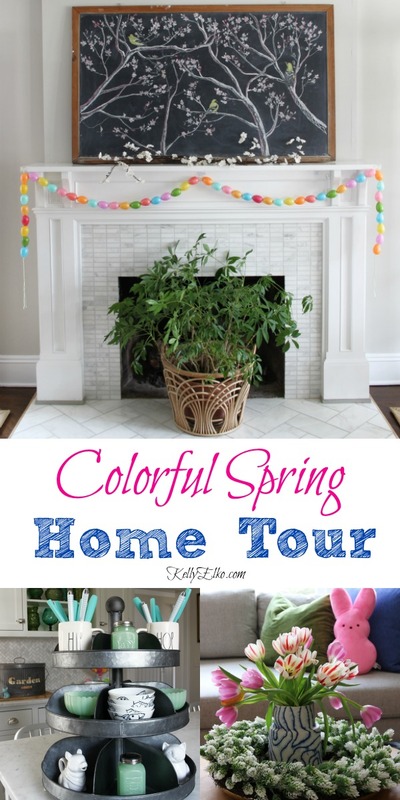 I’m sharing my whimsical spring home tour where I used some things old, some things new, and lots of things fun and colorful. 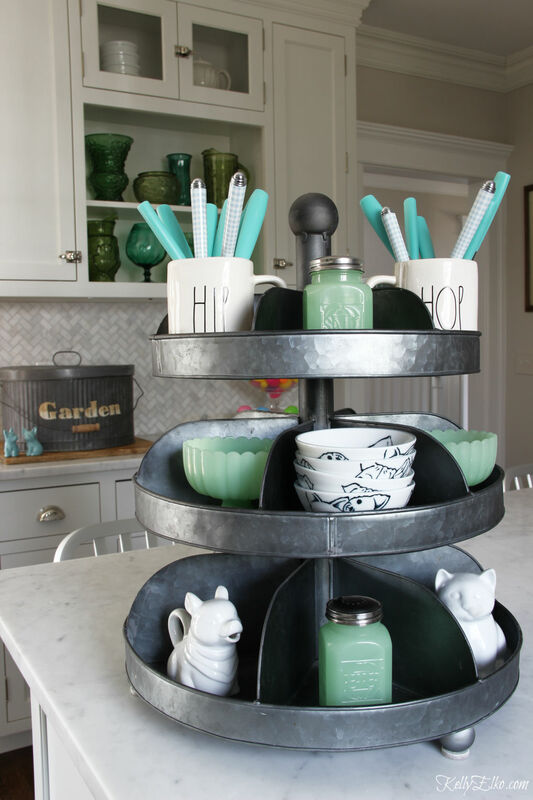 There is nothing like a few pops of color scattered around the house to add happiness. My color scheme is a collection of things I love and somehow they all seem to work together. I packed away dark and heavy colors in place of things lighter and brighter. While you are touring my home, I’ll be at the Warhol exhibit at the Whitney Museum in Manhattan. Make sure to follow me on Instagram @kelly.elko where I’ll be sharing some fun scenes from my day. 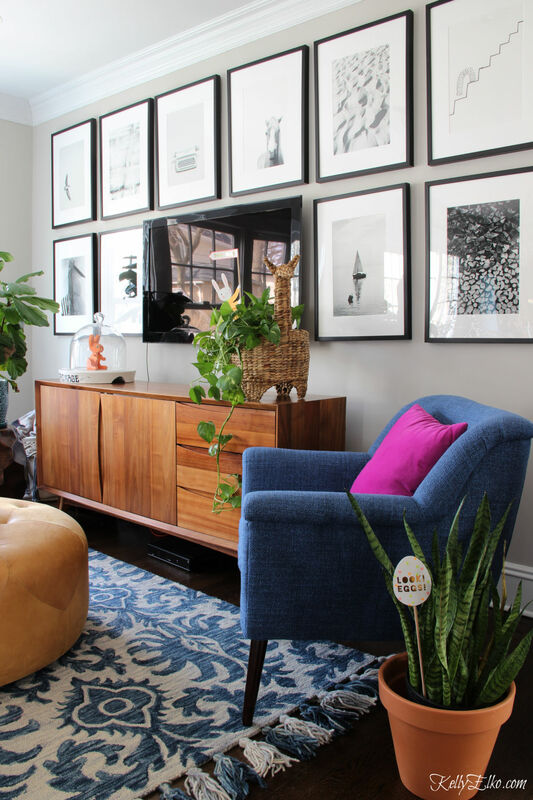 We did a complete gut renovation on our 1903 house 10 years ago and I am still in love with my choices. 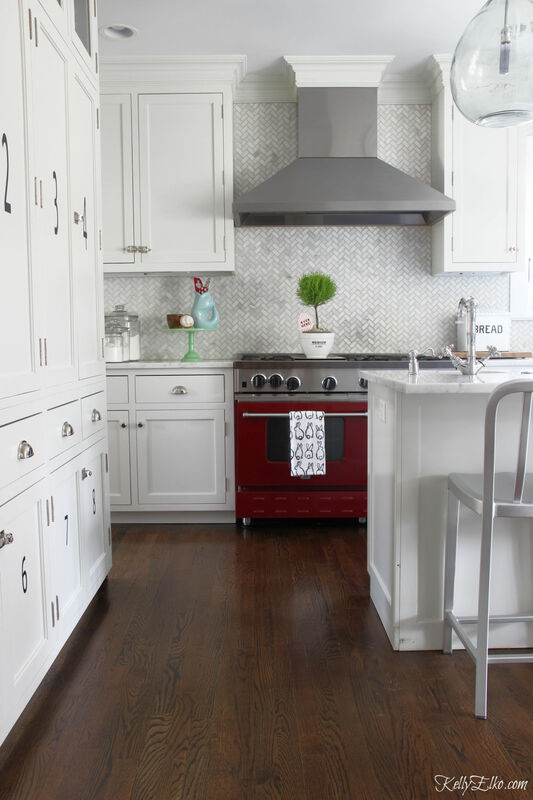 Going classic on big ticket items like tile and cabinets means they will never go out of style and I have the perfect backdrop to change out my displays. 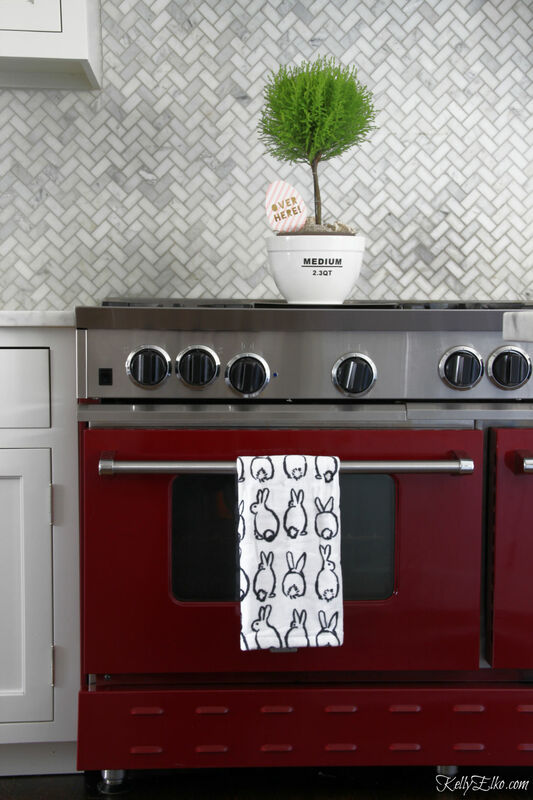 My red stove is just plain fun and adds such personality to the kitchen. I have always had a love for real plants and this lemon cypress topiary I found at the supermarket smells heavenly. Graphic black and white bunny towels remind me of the super expensive Hunt Slonem hutch art. I love rotating my collections and this thrift store green glass is a favorite. 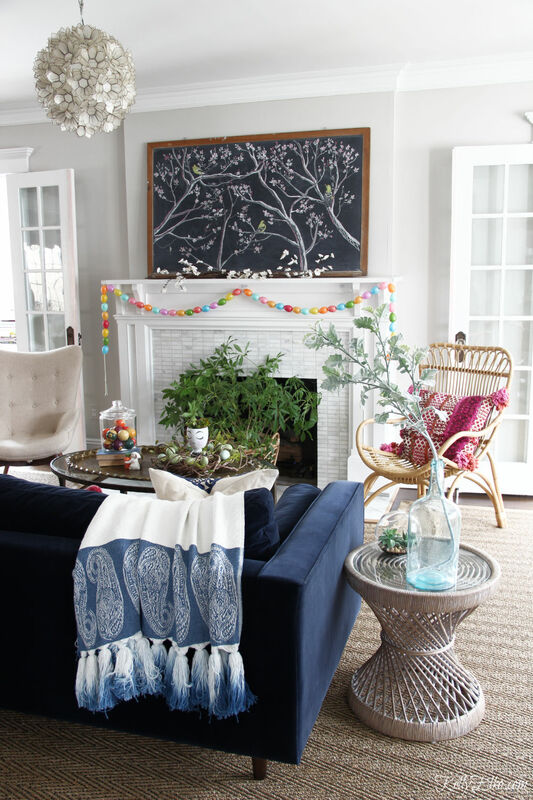 I shared this chalkboard art mantel a couple of weeks ago and even turned the original chalk art into a free printable that you can get here. 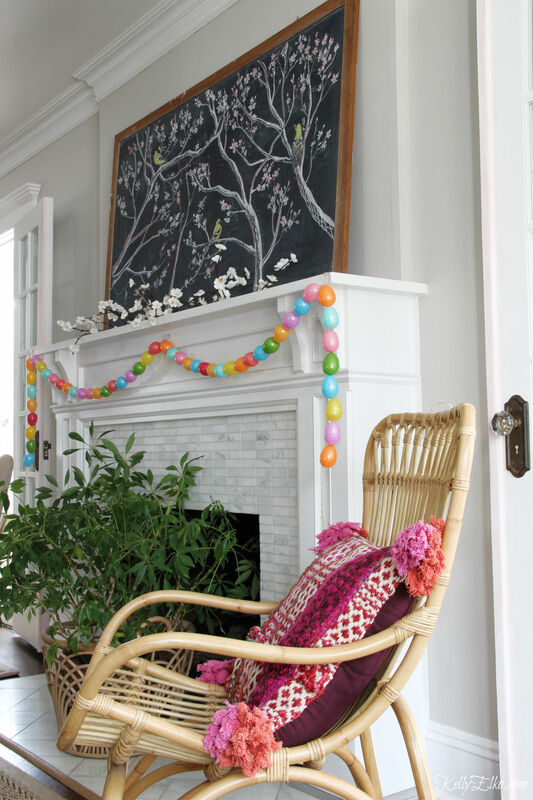 I made this egg garland years ago and love the bright colors! 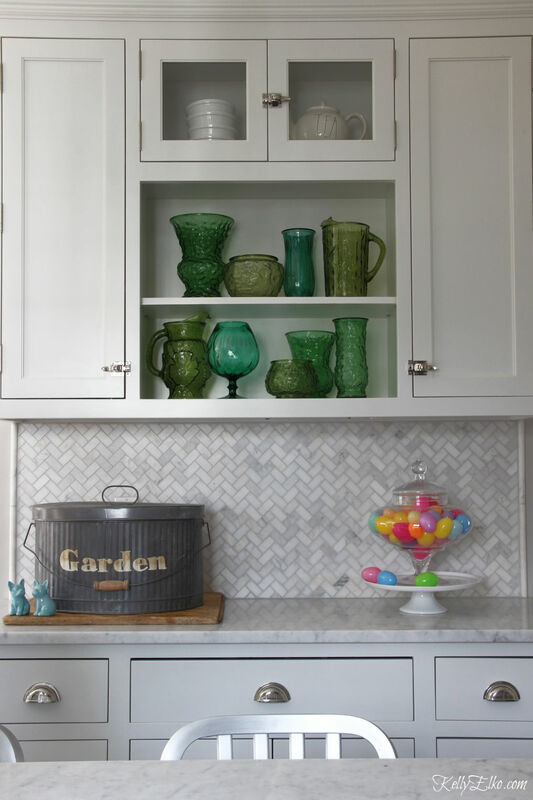 Open shelves get a makeover with colorful baskets and vintage green glass buoys. I LOVE peonies and anxiously await their short bloom time every spring. 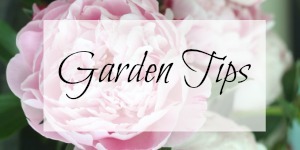 I took this pic of some of my peonies and turned it into a free printable so you too can have peonies all year long. 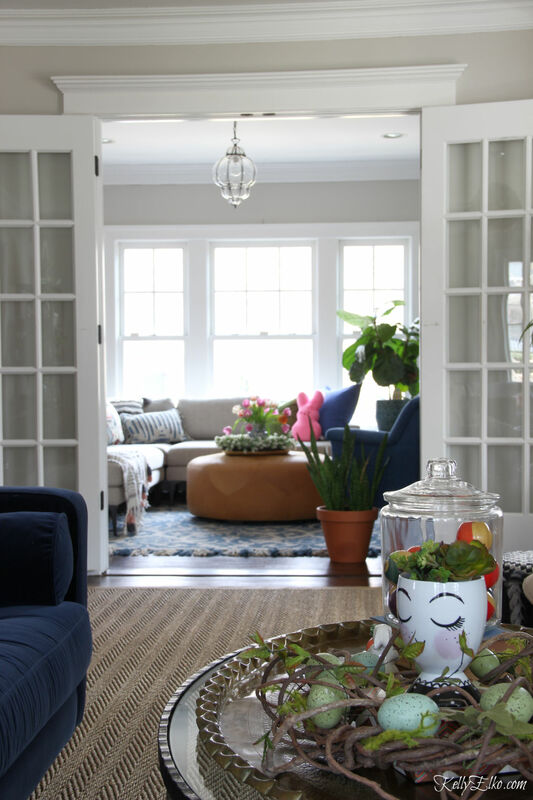 I consider blue and green to be neutrals and think they mix well with lots of different colors. 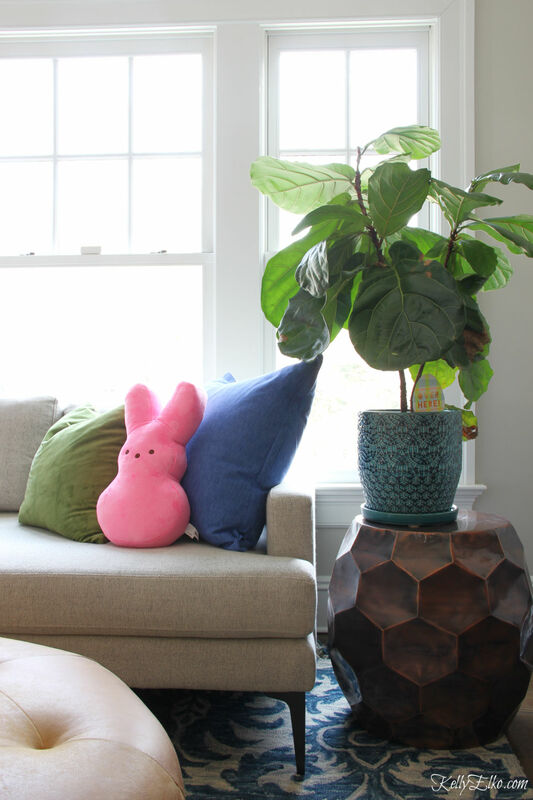 The pink peep pillow is my favorite new find! Wreaths aren’t just for walls! 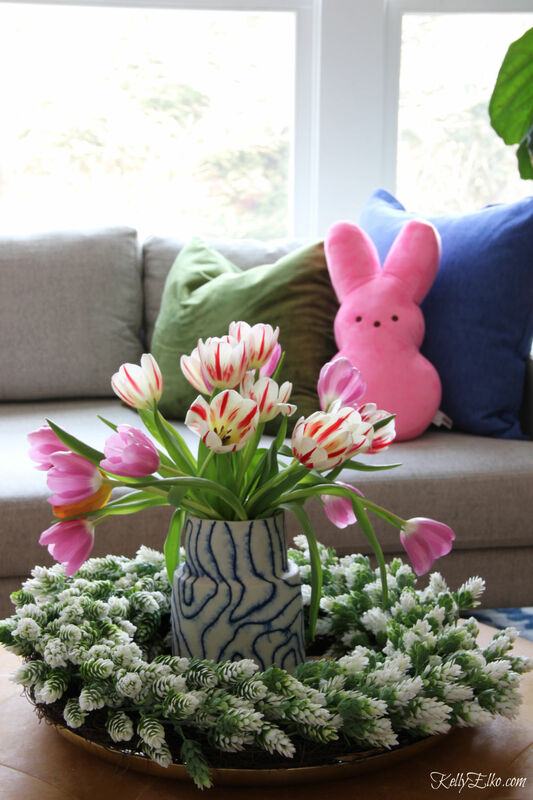 I love using them in my table displays and this one is perfect circling a vase of fresh tulips. 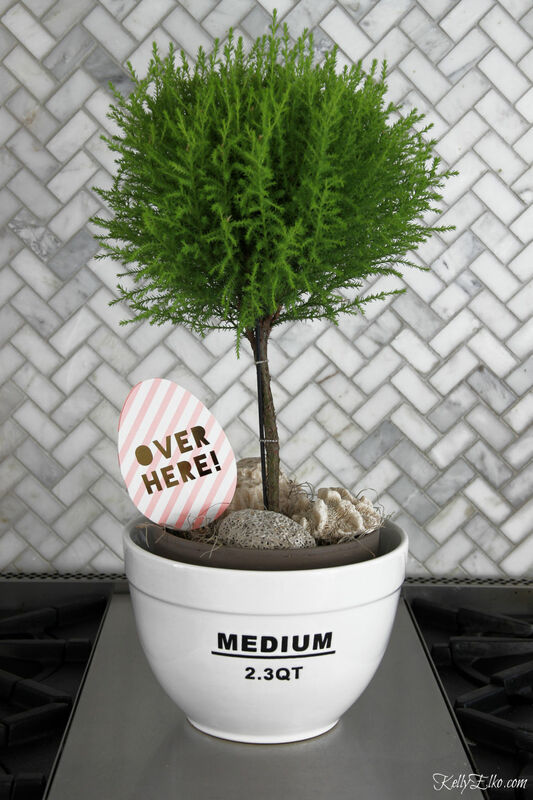 I scattered these cute little Easter egg hunt signs in plants throughout my house. This is such a simple extra touch that is sure to make anyone smile. 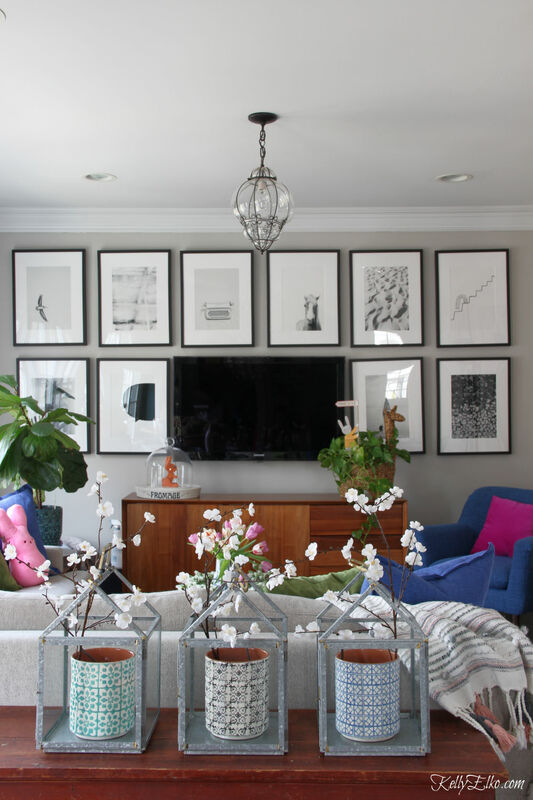 I love the way the black and white gallery wall helps the ugly black tv blend in with the art. You can info on all the photographs and see the sad before in this post. 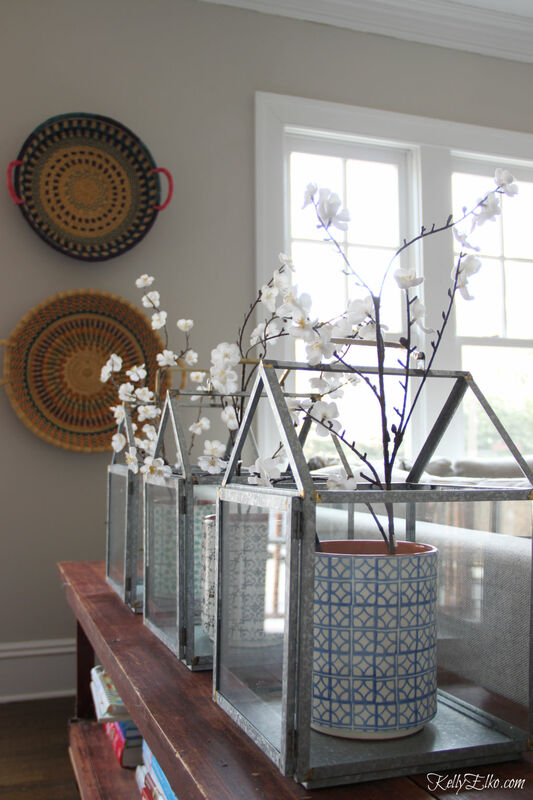 This past Christmas, I used these metal house lanterns as my Christmas centerpiece. 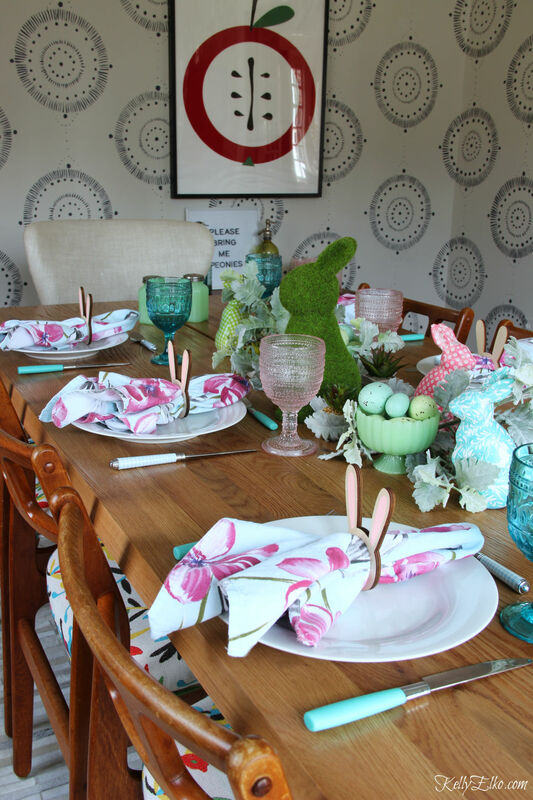 You can see my vintage Shiny Brite Christmas dining room here. 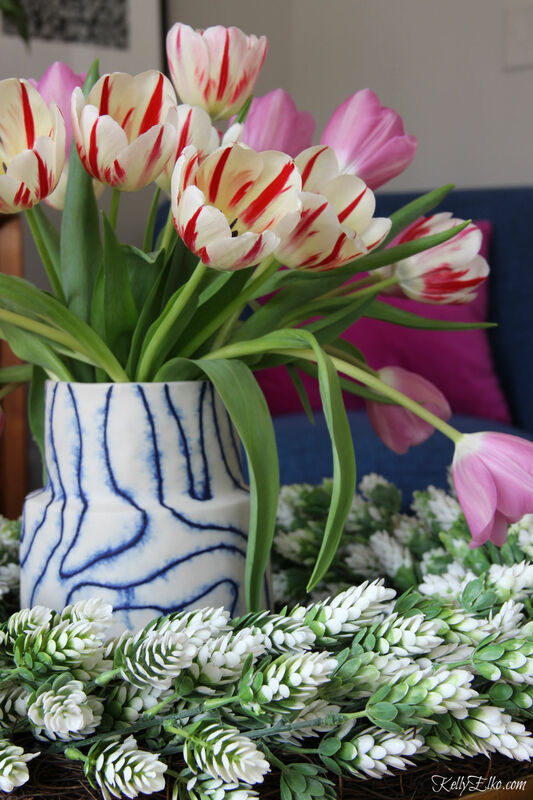 For spring, I added colorful vases and sprigs of faux flowers. 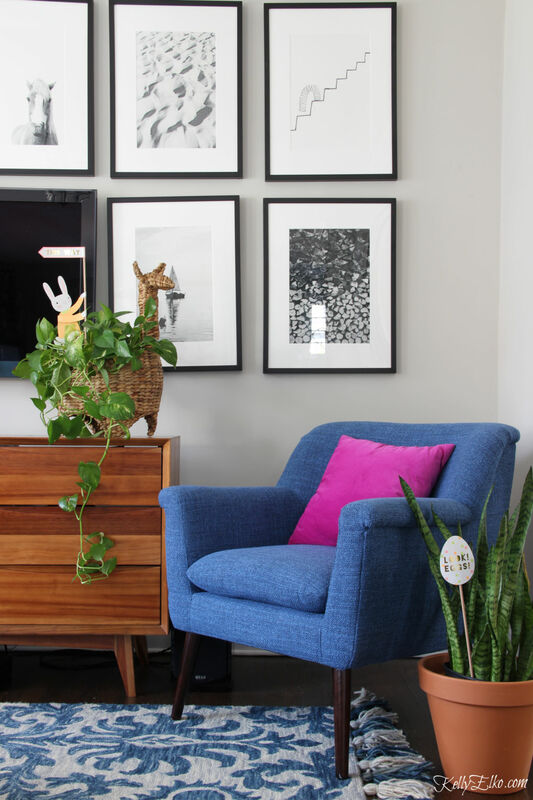 Ever since I added the hand painted mural to the walls and upholstered these Danish modern chairs in a colorful Otomi fabric, I’ve been loving the personality of my dining room. Peter Cottontail and his family is hopping across my table. 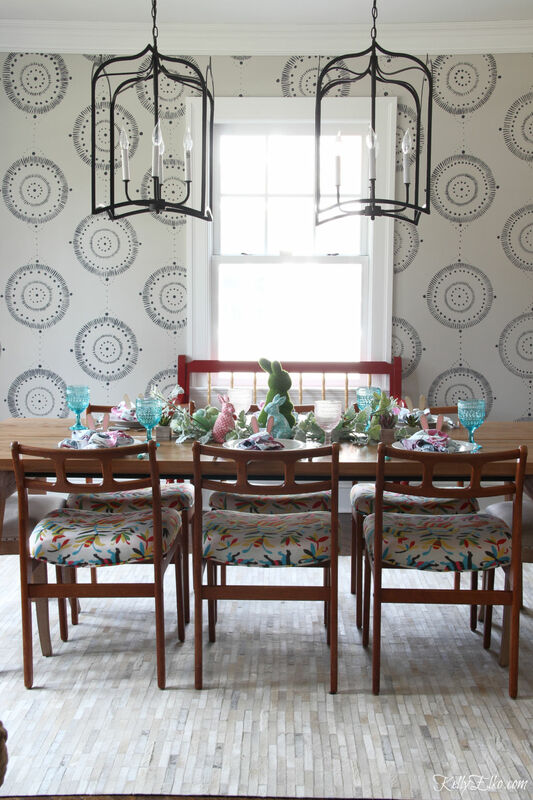 You can see lots more pics of my spring dining room here. 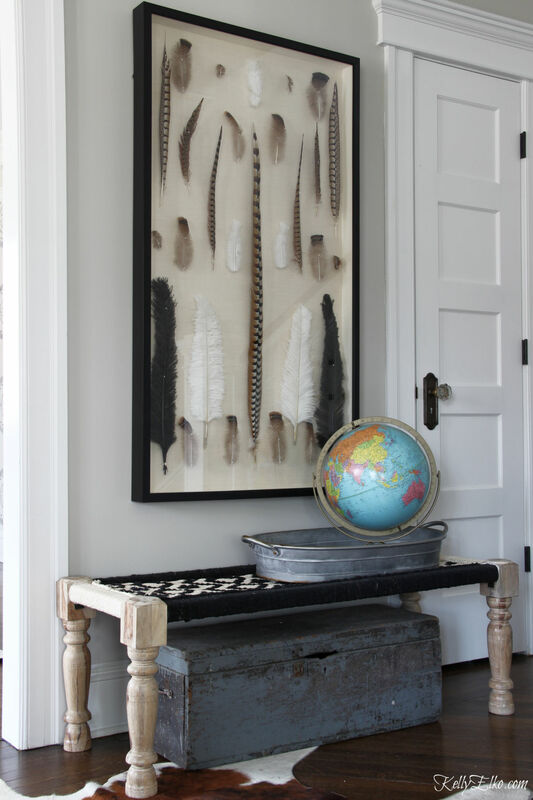 Seasonal decor doesn’t have to be literal. 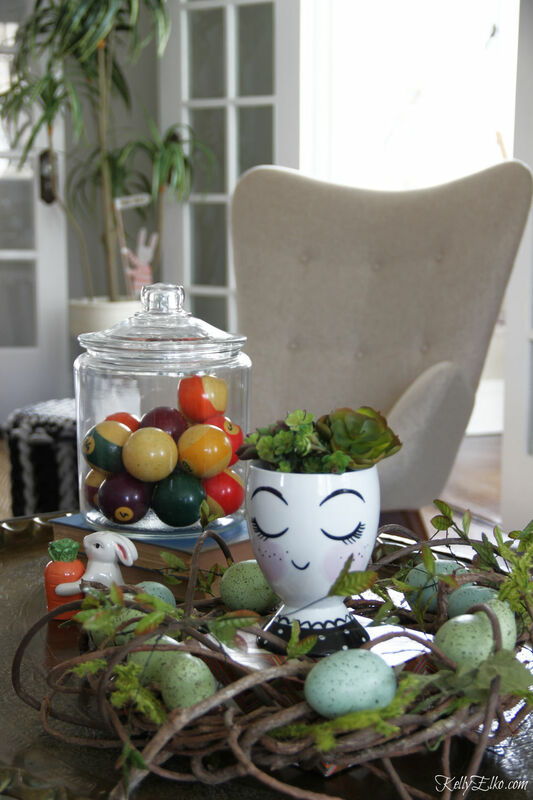 Bunnies and tulips are fun but I also love using vintage pieces in spring like colors like this vintage globe. May the sun shine, the birds chirp, the bunnies hop and your Easter basket be filled with all the Cadbury eggs! Thank you Lisa! I hope you have a beautiful spring weekend! It all looks lovely and fun but, ready for spring. Thanks for the visit and have fun. I love your home. 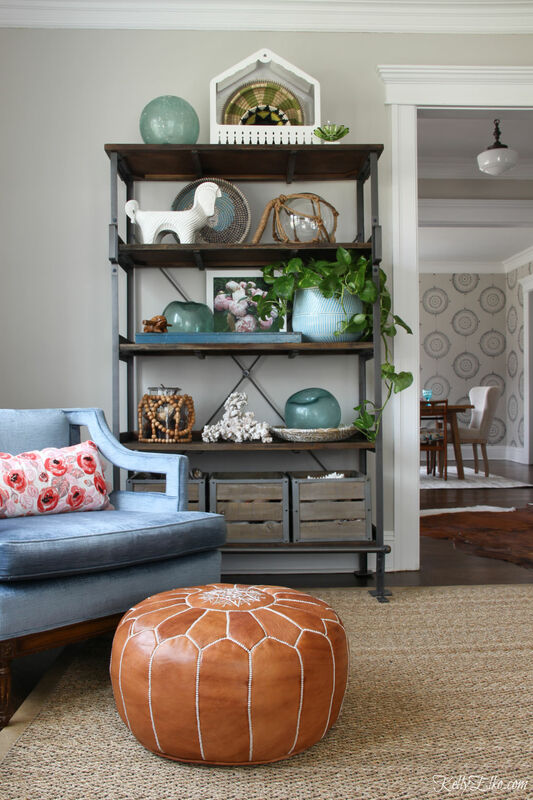 It’s so nice to see something different from all the farmhouse decor. 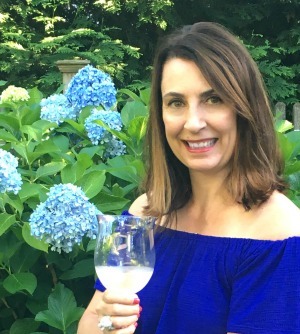 Thanks Ellen – I’m happy to not follow the farmhouse craze! 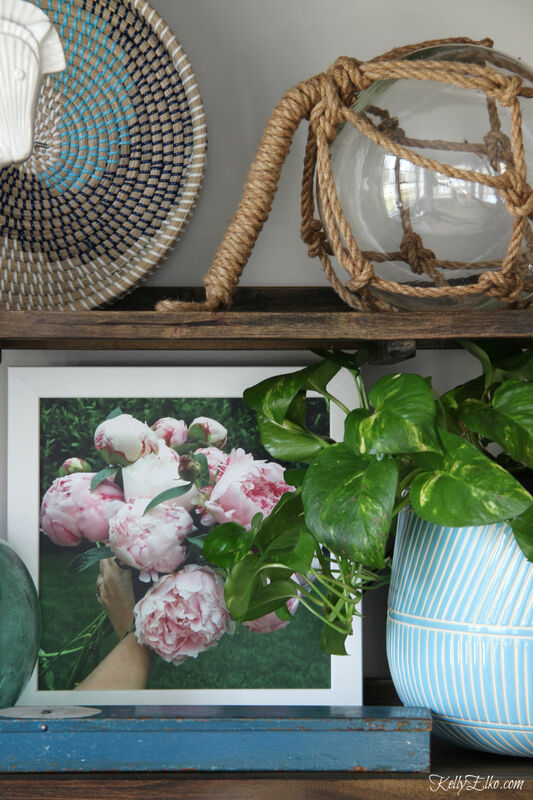 Yippie for peonies! Mine are popping up too – can’t wait to cut them! 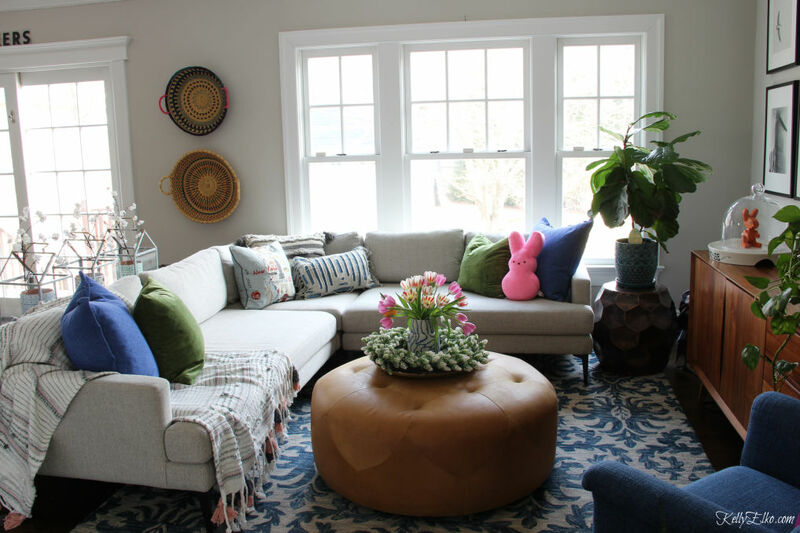 So Beautifully done Kelly!…Spring is certainly in the air in your home! Thank you Shirley and I hope you are having a happy (and warm) spring! 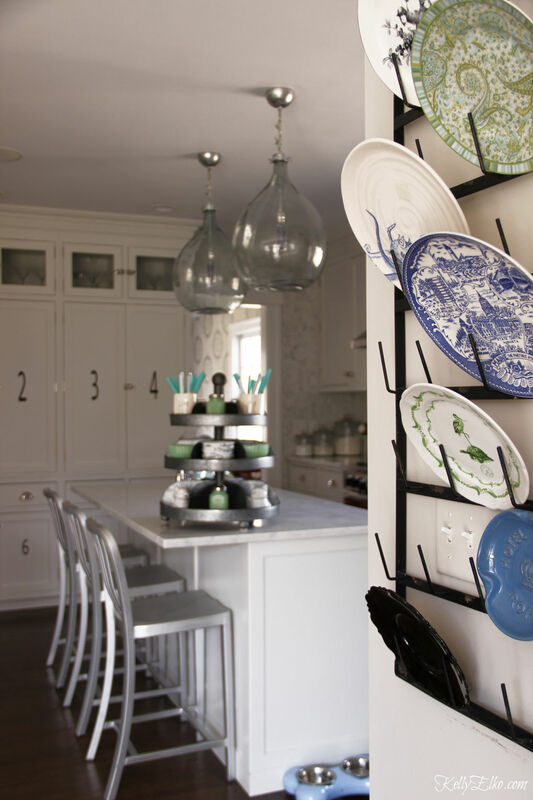 Where did you get the plate rack? P.S. I love the Spring Tour!